It might be that I was watching events unfold from within the fireplace, but my indie-dev-heavy Twitter feed was ablaze last night with jibes about the new THQ Humble Bundle. Because while buyers found themselves subject to a shockingly good deal – and nobody needs a few spare bob right now like THQ – many simply saw the purveyor of all things indie in bed with a major publisher and found their credibility compasses spontaneously exploding. Now Humble Bundle have talked a little about their agreement with THQ, and RPS have found them unrepentant. 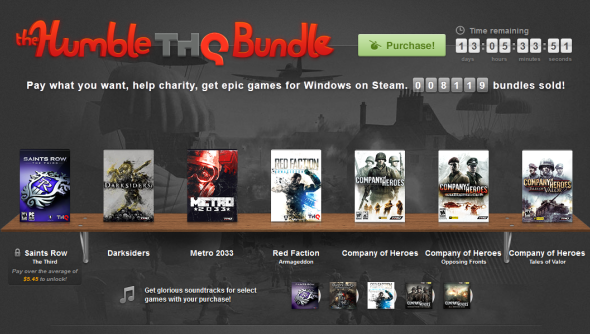 At time of writing 40,000 Humble THQ Bundles have been sold to the tune of $2,275,898. Proceeds are split between THQ, charitable causes and Humble themselves at a ratio of the buyer’s choosing. Right now, the top contributor is THQ president Jason Rubin. “We are hopeful that this excitement is growing our community in a way that can only help our future promotions, and rest assured that indie bundles will continue to be an important part of our business,” added the rep.
Have you picked up the THQ bundle? Will you?